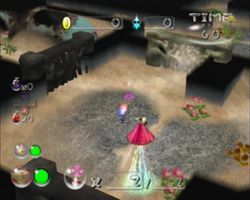 Concrete Maze is the twelfth level in Challenge Mode in Pikmin 2. As the name implies, its levels are mazes made out of concrete walls. On the first sublevel there are no enemies. The caves are complex in their layout, however, and as time is short as well, the essence of winning here is speed and a hint of luck. Resetting until The Key is quickly found is helpful. Breaking down walls is very quick, even with just one Pikmin. On the second sublevel there is a more complex layout and some enemies; these are mainly bomb-rock and Volatile Dweevils, both of which will fall randomly from the sky. It is often possible to outrun the dweevils even if the Pikmin are carrying the key. This doesn't mean that there is always enough time to escape. The third sublevel is very small and contains two Queen Candypop Buds, along with the Worthless Statue and Priceless Statue. There are no enemies on this sublevel, but time is still short, so you should gather the treasure and leave as soon as possible. This page was last edited on March 17, 2017, at 20:12.